Salmon was on sales. Button mushrooms were on sales. 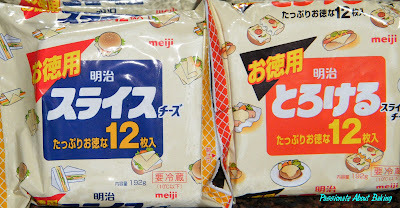 Bulk discount for Meiji cheese. No prize for guessing what I made for Saturday lunch. The theme for lunch was, anything that can use cheese. I also had a new "toy"- grilling pan, which I bought from Tangs quite some time ago. So I decided to use the grilling pan to grill my salmon fillets. I thought there will be splashing all over. However it didn't. Probably because I used butter? Maybe it won't splashed in the first place. I love the grilling marks it left on my fillet. Here was the menu for lunch. 1) Salad - coral lettuce, cherry tomatoes, basil leaves, raisins, onions, olive oil, pepper & rock salt. 3) Stir fried button mushrooms with cheese. 4) Garlic toast - fried garlic with butter and toast. 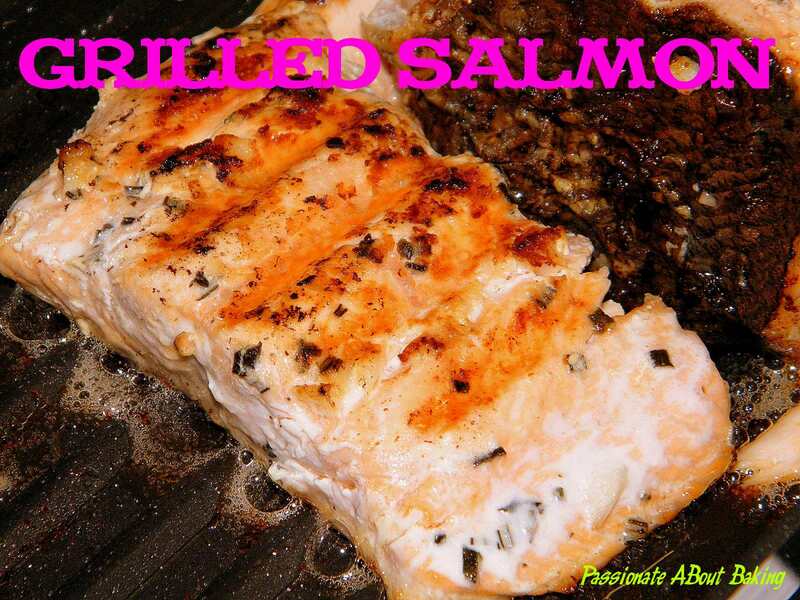 5) Grilled salmon - Marinated with rock salt and rosemary. Use butter to grill the salmon, then add the cheese after it's cooked. They look so scrumptious Jane. You always cook Western for you family? I remember, when I was still in Malaysia, Western treats are rare occasions, like when someone's birthday is around the corner, then we'll all get excited to be able to choose which western restaurant to dine in. Gone were the days...your husband and children are so lucky to have a mother and a wife like you Jane! Everyday is birthday with you around! I am gg to try salmon with rosemary san the cheese cos My body is intoxicated with cheese! Jane, this is such a wonderful meal and so delicious. I dun usually cook, if I cook will be more to western but definately not as gd as yours. wow... i am drooling... yumm. Hahaha...ya, both of us are overdosed with too much cheese, thanks to you! Oh yes, please do try salmon. It's really nutritious! Thanks. I've always love cheese on mushrooms. I usually add chopped garlic to bake too! Thanks. I'm sure you can do it too! 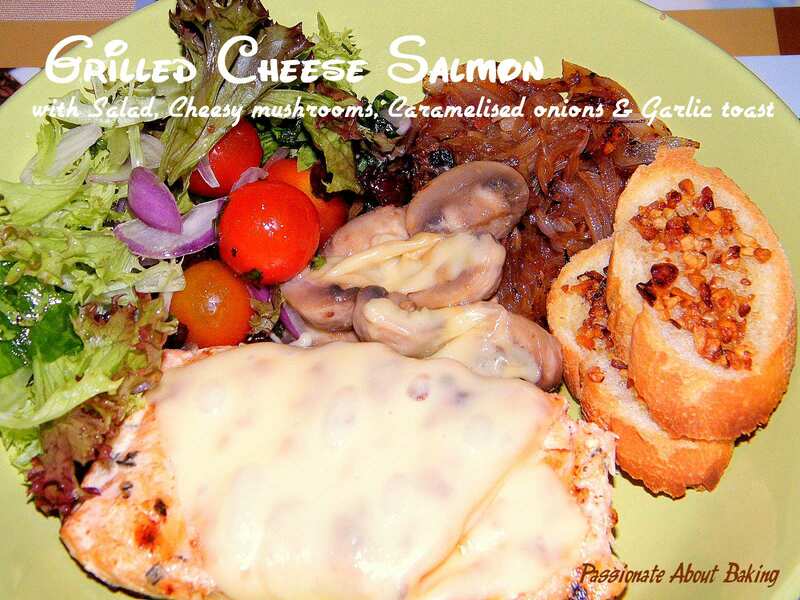 This cheesey meal is inviting with a promising lineup of salad, sides and grilled salmon. Definitly a meal worthy for celebrations. When me and a group of my friends meet up for bbqs, we will do grilled portobellos with mozzarella. its chewy, cheesy and juicy. 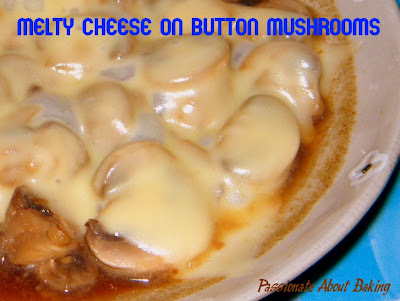 mushrooms with cheese just cant go wrong. I love cheese, too! The cheesier, the better! When I bake pizzas, I make sure the layers are topped with oodles of mozzarella upon baking! Sinful but good! Hey, I have a griddle too ... But it's been left at one side for a long time ... Hopefully, it'll see sunlight again ... I bought it just because I love Korean and French foods! LOL! Hi Jane. 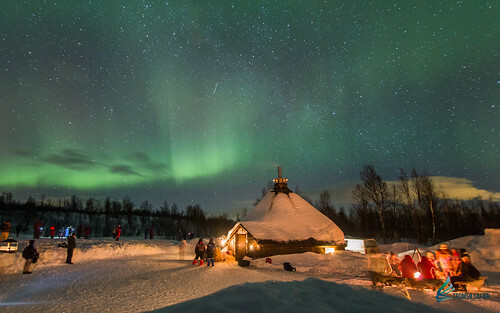 Wow, what a spread- your kids must been thrilled! 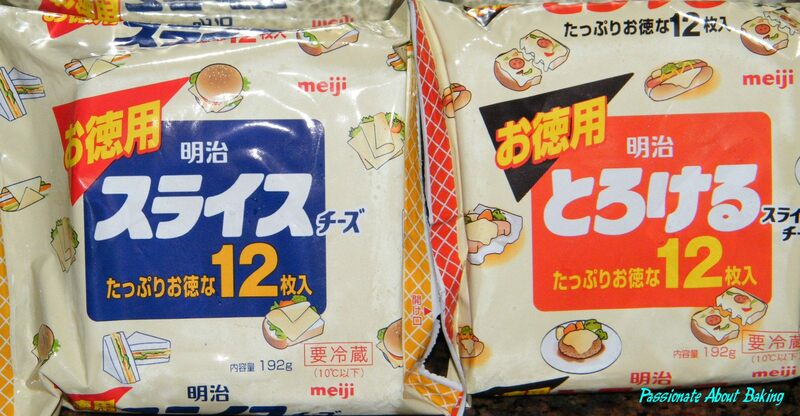 I'm a bit embarrassed to admit this but I never knew Meiji had a line of cheese products!